Cares, C.; Franch, X.; Perini, A.; Susi, A.
Goal-oriented and agent-oriented modelling provides an effective approach to the understanding of nowadays distributed information systems that need to operate in open, heterogeneous and evolving environments. Existing frameworks have been extended along language variants, analysis methods and CASE tools, posing language semantics and tool interoperability issues. We focus on i*-based modelling languages and tools and on the problem of supporting model exchange between them. As a first step towards providing a practical solution, we introduce an XML interchange format called iStarML. In this report, we describe the iStarML format providing examples to illustrate its use. Cares, C., Franch, X., Perini, A., Susi, A. 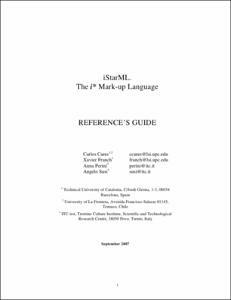 "iStarML: The i* mark-up language". 2007.